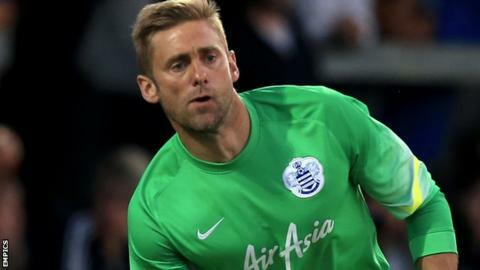 QPR goalkeeper Rob Green thinks the future of the club is looking brighter after their summer transfer dealings. The R's made 13 new signings following their relegation from the Premier League, while also retaining midfielder Leroy Fer and striker Charlie Austin. "The turnover of players was high again but we have got a the basis of a young squad which can improve," Green, 35, told BBC London 94.9. "These lads can stay for three or four players and grow as a unit." He added: "We can keep hold of the players rather than rely on the turnover of players to keep it competitive." The west London side sit ninth in the Championship table after eight games of the campaign, five points off the automatic promotion places. Green says keeping hold of Austin, who has scored seven goals in eight appearances this season, will boost their hopes of an immediate return to the top flight. "Before the close of the transfer window nobody truly knew what was going to happen," the former Norwich and West Ham stopper said. "People not moving - without a flurry of ins and outs on deadline day - was a welcome change and a positive one. "The club can reassess. We are looking at maybe having a stronger season through the personnel [we have]. "The Championship is difficult to call over a whole season and we need everybody we can hold on to. "So far the club have managed to do that. The joys of the football season is there is another transfer window around the corner, but we will cross that hurdle when we come to it."